Sometimes things go horribly wrong and you’re left trying to figure out how to move forward. 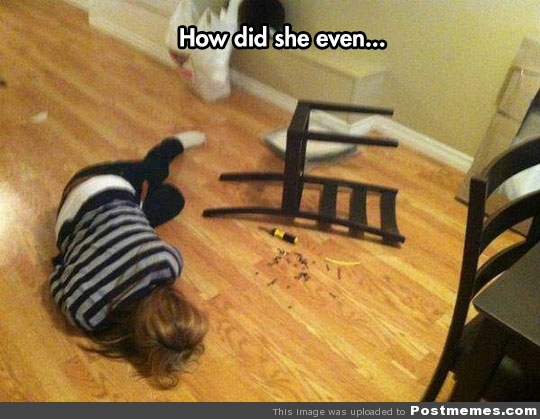 This happens to me every single time I try to assemble Ikea furniture. As some point, I end up staring at the instructions, the bits and pieces, the joke that is a half created monstrosity and wondering how this got so messed up. If I am unable to dupe some dope into building my furniture for me (Sarah & Colbster I’m talking to you) and I am stuck building my own, there inevitably comes a point where I want to give up and light the whole thing on fire. The key to ikea furniture and maybe life in general, is that when you get to the end of ability to be productive, you need to stop and reframe the issue. It might be cheesy or naive but I believe all but the most tragic of situations can be reframed (not that I’m necessarily good at practicing this). You can focus on the positive and try to keep moving forward. As it turns out, deep breathing is one of those amazing little biological events that can alter your heart rate and even your body chemistry. Breathing deeply can give you the few seconds you need to step back from the situation and put the lighter and gasoline down. Go back to the why. Why are you so frustrated? What happened that changed your outlook? Originally you were just building a bookshelf, or having a conversation. What changed that made your reaction change? This is especially important when trying to reframe your perspective. Figuring out the why can help you figure out what’s next. Ask yourself how to get to a solution. This is a tricky step for sure. One potential solution is burning down the bookshelf, sure. But is it one that will make you feel better in the long run? Probably not. You should be able to put this together by yourself. You should be able to ask your boss to fix it. You should live in a world where issues resolve themselves but you don’t. The reality of the situation is that you’re going to have to find another way. What are all your alternative routes to success? List them out. Get excited about having a list of possibilities versus being stuck without resolution. At some point, you’ve got to do it and the less time you spend being stuck on a problem, the sooner you’ll feel better. Pick one of your alternate solutions and start giving it a go. It might not work but then you’ve made a list of all your alternatives so you can give those a try next. The point is that you keep trying. In the case of the Ikea furniture, I’ve learned to ask someone ANYONE for help. I find someone who can do it and then I try to get out of their way and let them build. But in other places of my life, I do the work myself. You can too. Is there a lack of leadership at your job? Why don’t you step up and be a leader? Are you running into the same problem over and over again with your significant other? Why don’t you brainstorm alternative solutions together? Are you frustrated by someone because they should do something? Why don’t you stop waiting on them and find an alternative path? Life is too short to get stuck in the negative. It’s too expensive to burn all your Ikea furniture. Move on. Keep your head up. Think about all the possibilities and get over your own hurdles without lighting anything on fire. Photo credits by Flickr users Post Memes and Kate Palana.